Patterned with star-like figures on their shells, Indian star tortoises can be found in private homes across Asia, where they are commonly kept as pets. One can also see them in religious temples, praised as the living incarnation of the Hindu god Vishnu. How did they get there? 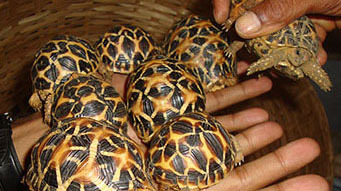 Suspicious of a large-scale illegal international trade of these tortoises that could in fact pose a grave threat to the survival of the Indian Star tortoise, a team of researchers, led by Dr. Neil D’Cruze from Wildlife Conservation Research Unit, University of Oxford, and World Animal Protection, London, spent 17 months investigating the case focusing on India and Thailand. They have their study published in the open-access journal Nature Conservation. The present study established that at least 55,000 Indian star tortoise individuals are being poached over the span of a year from a single trade hub in India. Helped by a number of herpetologists and wildlife enforcement officials, the researchers have tracked signals about how sophisticated criminal gangs are exploiting “legal loopholes” and people alike, taking advantage of rural communities and urban consumers in India and other Asian countries. Although deemed of “Least Concern” on the IUCN Red List when last formally assessed back in 2000, the Indian star tortoise and its increasing illegal poaching and trading can easily lead to a serious risk of the species’ extinction. Other dangers of such unregulated activities include the introduction of invasive species and diseases. Having spent a year among a rural hunter-gatherer community, researchers established the collection of at least 55,000 juvenile wild Indian star tortoises between January and December 2014. This is already between three and six times more than the last such record dating from about ten years ago. Collectors tend to poach juvenile tortoises, but it is not rare for them to also catch adults. Based on the individual’s age and health, the tortoises are later sold to vendors at a price of between 50 and 300 Indian Rupees (INR), or between 1 and 5 USD, per animal. “Therefore, we conservatively estimate (assuming no mortalities) that the collector engagement in this illegal operation has a collective annual value of up to 16,500,000 INR (263,000 USD) for their impoverished communities,” comment the researchers. Consumers seek the Indian star tortoise for either exotic pets or spiritual purposes. With their star-like radiating yellow patterns splashed with black on their shells, not only is this tortoise species an attractive animal, but it was also found to be considered as a good omen among the locals in the Indian state of Gujarat. During their survey, the researchers found over a hundred hatchlings in a single urban household. However, their owner claimed that none of them was kept with commercial intent, although some of the tortoises were meant for close friends and relatives. On the other hand, there was a case where the researchers came across a Shiva temple hosting a total of eleven Indian star tortoises. Temple representatives there confirmed that the tortoise is believed to represent an incarnation of the Hindu god Vishnu, one of the three central gods in the religion, recognised as the preserver and protector of the universe. In India vendors do not show the reptiles in public, but they are made available upon a special request. If paid for in advance, a vendor can also supply a larger quantity of the animals at a price ranging from 1,000 to 3,000 INR (15 to 50 USD) per animal. The researchers managed to see seven captive tortoises in private, including six juveniles and one adult, all in visibly poor health. Disturbingly, in order to reach these vendors, the collected tortoise are usually wrapped in cloths and packed into suitcases. Covered by a ‘mask’ of legal produce such as fruit and vegetables, they are transported to the ‘trade hubs’. They are also smuggled abroad to satisfy consumer demand among the growing middle classes in countries such as Thailand and China. As a result of their study, the authors conclude that more research into both the illegal trafficking of Indian star tortoise and its effects as well as the consumer demand is urgently needed in order to assess, address and subsequently tackle the issue.